With the 2017 NBA Draft just finished this last June, this draft class contains every prospect who declared for the 2017 NBA Draft. Some players went undrafted but that doesn't mean that their NBA career is over. Many great players also went undrafted and got signed through free agency. This draft class is already considered one of the best even if the new NBA season hasn't started yet. 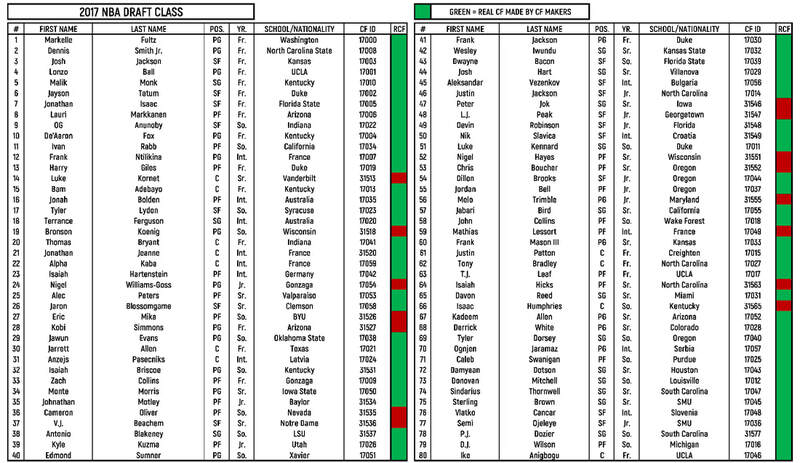 Try for yourself using these draft class on how will these players become when they play in the NBA. Increased Top OPR (Overall Player Rating) to 78 and the Lowest to 60. Implemented the 2K Rating Formulas for the 2017 NBA Draft Class. Realistic Ratings based on their Basic Stats (per-40 min) this season (Shot Close, Shot Medium, Shot 3PT, Free Throw, Layup, Shoot in Traffic, Post Fadeaway, Post Hook, Offensive Rebound, Defensive Rebound, Ball Handling, Off Hand Dribbling, Shoot of Dribble, Ball Security, Pass, Steal, Block, Hands, On-Ball Defense, Low Post Offense, Lost Post Defense, Offensive Awareness, Defensive Awareness, Stamina, Speed, Quickness, Strength, Vertical, Hustle). Realistic Vertical Leap for every Prospect based on latest Draft Combine Measurements. Realistic Tendencies based on their Usage & Efficiency Stats this season. Realistic Signature Skills, Shooting Forms, Shot base, Shooting Hand. [I'm using Seushiro's Animation Mod v3.1b so shooting forms may vary.] Hot Zones based on Draft Combine Exercises & Measurements. Gears used by players are based on what they usually wear the most on their games. Download 2017 Draft Class and 2017 Draft Class Cyberface Pack. Extract the contents of the 2017 Draft Class Cyberface Pack into your 2K Directory (Default:"C:\Program Files (x86)\2K Sports\NBA 2K14" for Windows 7 to 10). Create a new association then load the draft class. You can edit the draft class through Rosters/Draft Class. Q: "Is your cyberface pack compatible with Meds' PortrID and CF ID?" A: "Yes. I've made that possible for several updates now. If you download the latest All-In-One Cyberface pack ("Files FULL") it'll be compatible with his roster and mine." Q: "Do I need to download previous releases?" A: "No need to. I always upload All-In-One releases meaning that all files from the start and the updates will be on the latest pack release." Q: "Why does my game crash in the end of the 1st/3rd Quarters?" A: "You have an HD cyberface installed in either of the 2 teams that's playing when the game crashed. You have to replace that with an SD version of that cyberface." Q: "Why does my game crash before my game starts or before the jumpball?" A: "You have an HD dornas or an incompatible dornas with your stadium. You have to replace it with an SD version or a compatible version of that dornas to the stadium you're using." Q: "Why does my MyCareer crash in the 6th game or any games after that?" "If you want to contact me just e-mail me at my e-mail address by clicking the Contact Me button or just visit my social media websites."